Ever wondered how to make perfectly cooked, crispy and delicious potato latkes? 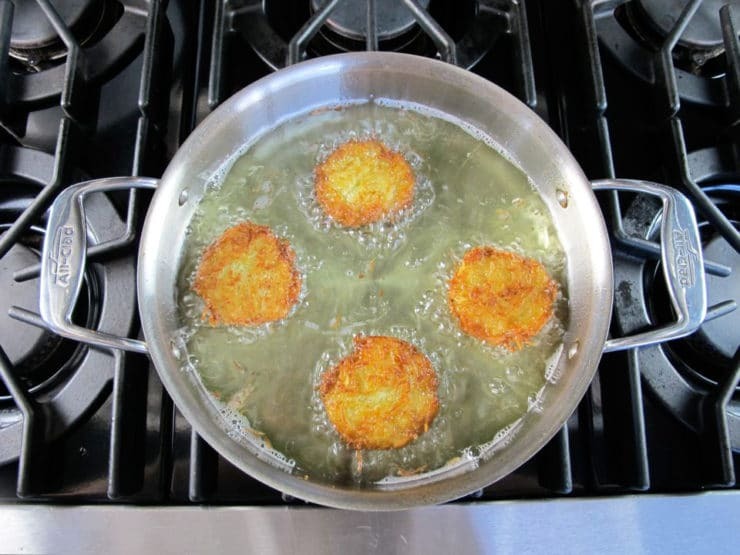 Having trouble getting your latkes to stick together and fry up light and crisp? 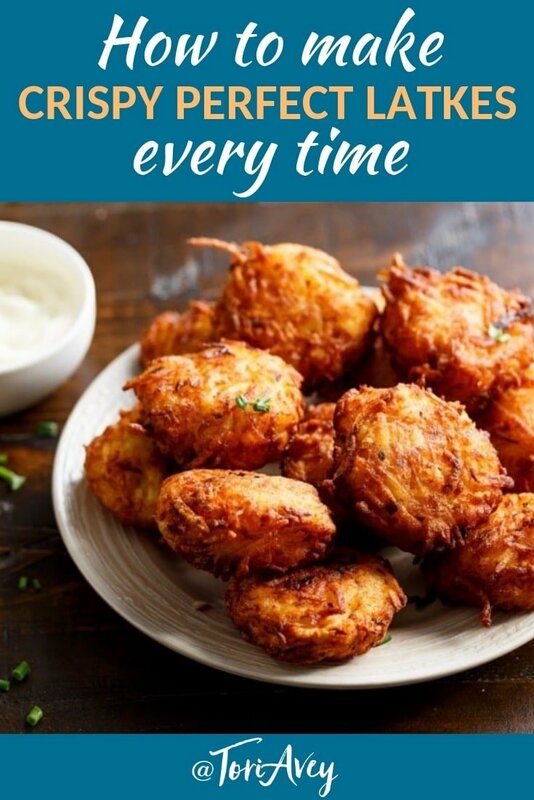 This post and video will walk you through the whole process, with links to time-tested recipes that produce amazing latkes every time! I celebrated my first Hanukkah several years before I converted to Judaism. I had studied Judaism in college, but I didn’t have any practical experience when it came to Jewish food or holiday traditions. Meanwhile, my husband-to-be was as Jewish as they come. He was born and raised in Israel by two Jewish parents and a rabbi grandfather. He grew up spinning dreidels and eating sufganiyot (Hanukkah jelly doughnuts). I grew up singing Christmas carols and hanging stockings by the chimney with care. My first attempt at cooking latkes was a minor disaster. Luckily, I’ve learned a thing or two since then. I thought it would be fun to put some of my most helpful tips into a post, so you can avoid the potato pancake pitfalls that I’ve experienced along the way. 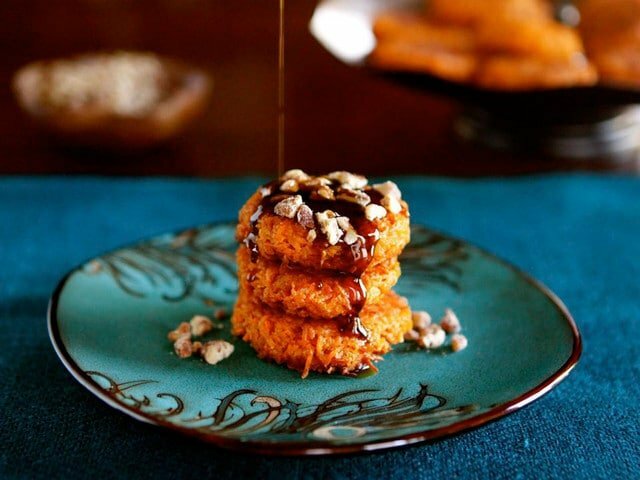 This post will give you specific tips for making amazing crispy latkes. 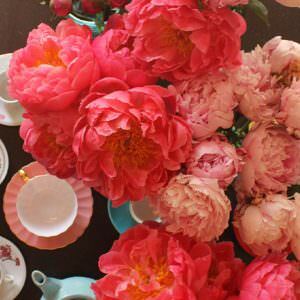 If you’re looking for recipes, scroll to the end of this post, where I’ve linked to some fabulous, time-tested options. Before we dive in, here are a few facts about latkes. – You can shred your potatoes with either a hand grater or a food processor with a grating attachment. Some Jewish cooks swear by the hand grater, saying it makes a big difference in taste. Others revel in the convenience of the food processor. Neither method is “correct,” it’s simply a matter of preference. Using a food processor will cut your prep time dramatically, and will also be easier on your arms and shoulders. For an easier alternative, you can use the bagged hash brown shreds found in the refrigerated section of the grocery store. Last time I checked those products do not have a kosher hechsher (that may have changed though). – Some cooks prefer using large shreds of potatoes, while some prefer a finer shred. My preference varies based on the recipe. Finer shreds tend to have a more hash brown-like texture. You can choose whatever texture works best for you. – After shredding your potatoes, immerse them in cold water to keep them from discoloring. 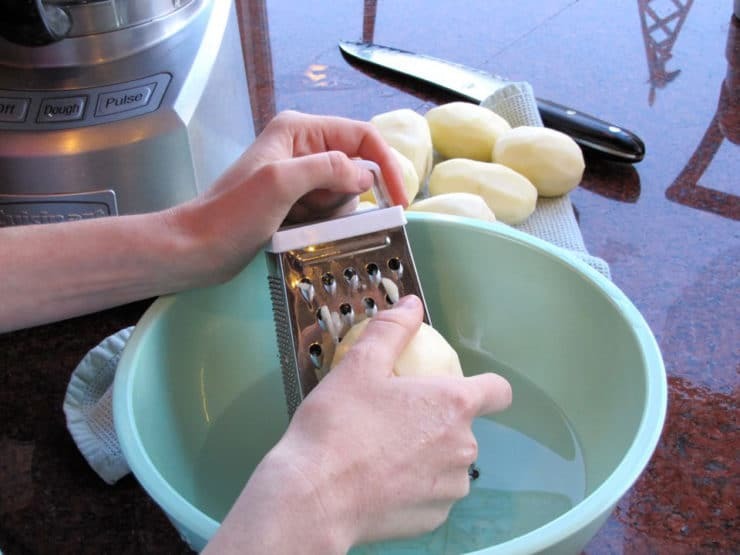 If you’re using a hand grater, you can shred them directly into the bowl of water. Soaking the shreds helps to keep them from turning brown; it also has the added benefit of making crispier latkes. I am not sure of the food science behind why this is, but it works! – When you’re ready to prepare your latke mixture, drain the potatoes. If you drain the shreds slowly with the bowl tilted, you will see a cloudy white layer that has settled at the bottom of the soaking bowl. This is potato starch. Scrape this starch up and add it to the shreds after you’ve drained them, it will help to bind the latkes together. I often add additional dry potato starch to the shredded mixture (sold by the can at kosher stores year-round and everywhere during Passover) to make sure the latkes don’t fall apart during frying. 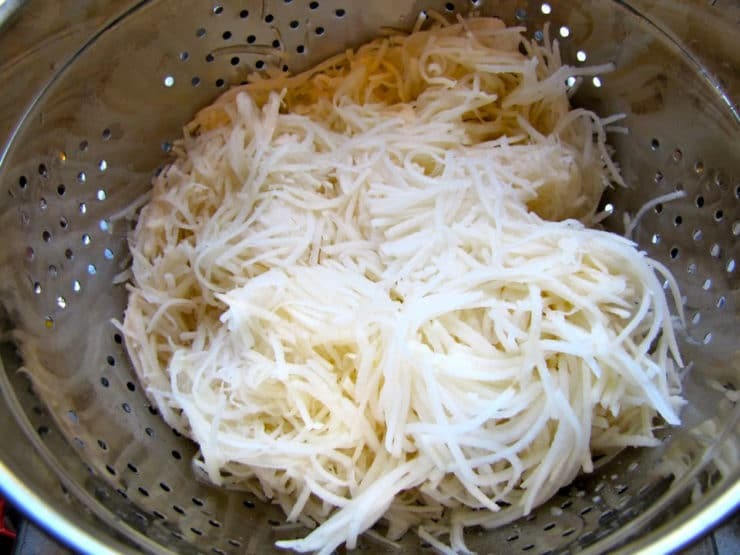 – Get as much liquid out of your potato shreds as possible before mixing in the egg and other stuff by wringing them out in a cheesecloth or a tea towel. The less moisture in the shreds, the better your results will be. – When you’re ready to fry, have a draining/drying rack set up close by with a layer of paper towels underneath. This is where the latkes should drain from the hot oil. I prefer draining them on a rack rather than directly on paper towels, I find they stay more crisp that way. Drop a small piece of bread into the oil. If it takes 60 seconds to brown, the oil temperature is perfect for frying. Place a kernel of unpopped popcorn into the oil. When the kernel pops, the oil is hot enough to fry. Once you’ve fried several batches of latkes you’ll get a feel for how hot the oil needs to be and you won’t need to test it anymore. 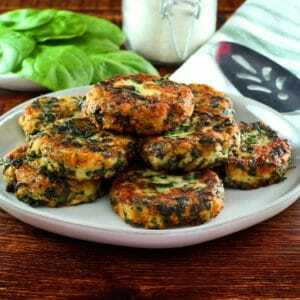 – Form your latke mixture into compact patties. I generally use about 3 tablespoons of potato shred mixture per latke, depending on the recipe. I’ve found that this amount makes small/medium sized latkes that fry up extra crispy. 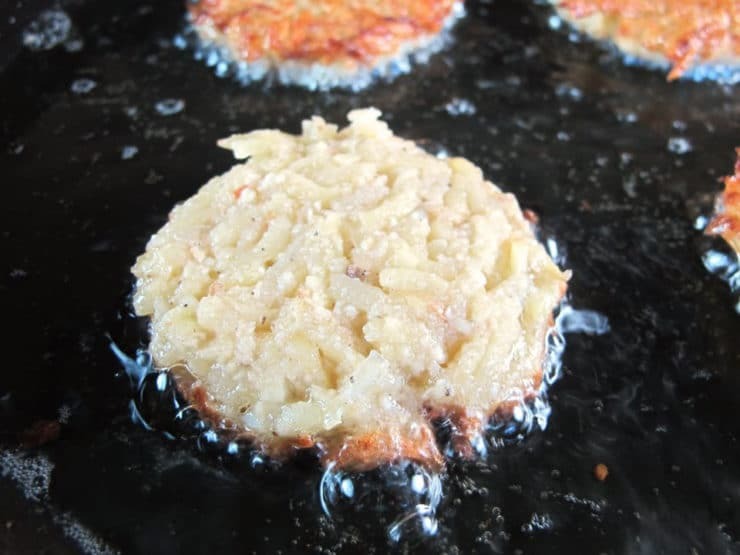 – Start with a “test” latke to determine if the oil is at the right temperature. The latke should take about 2-3 minutes per side to become brown and crisp. If it takes longer than that, the oil is to cold. If it fries faster than that, the oil is too hot. Once you’re happy with your test latke and the oil temp, you’re ready to fry. 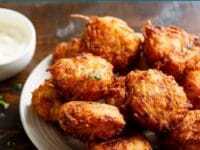 – Fry the latkes in small batches. 4-5 at a time in a large skillet works best. Trying to cook too many at one time crowds the pan and makes the temperature of the oil drop, which will result in soggy latkes. 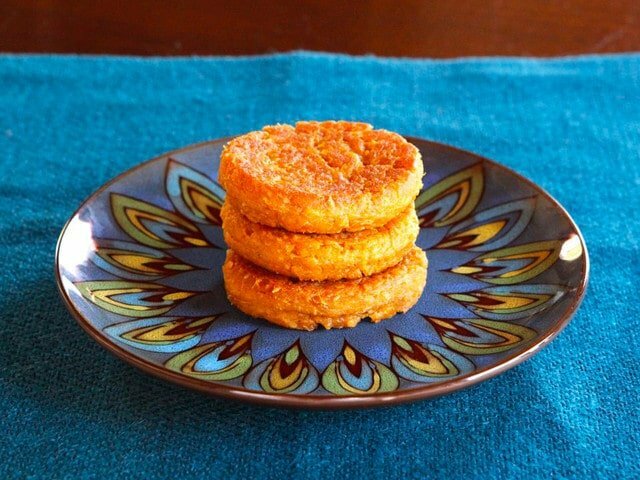 Flip them when you see the bottom turning golden brown around the edges. Give them adequate time to brown– the less you flip latkes the better. 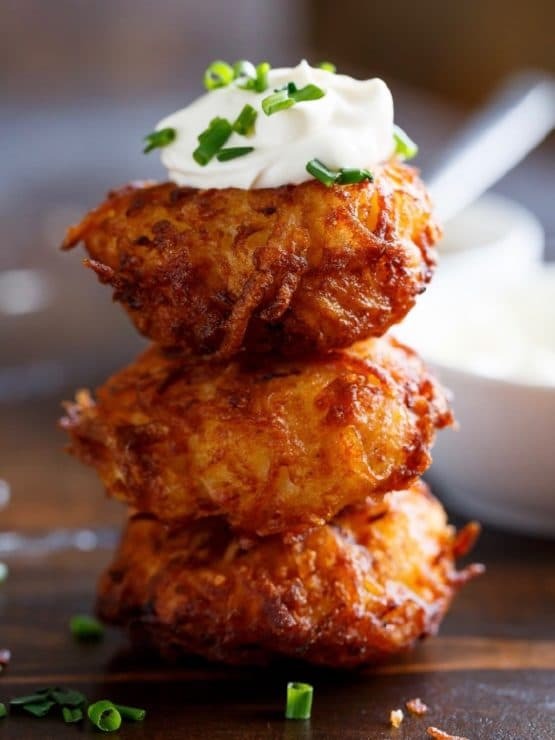 – If your latkes aren’t holding together, stir more potato starch into the mixture, 2 teaspoons at a time, till the batter “holds.” You can also add another egg to the mixture and more flour or breadcrumbs, if needed. – While olive oil and schmaltz are both traditionally used to cook latkes, they are not necessarily the best choice for modern cooks. Olive oil has a somewhat low smoke point, which means the oil can burn and discolor if it’s kept at a high frying temperature for a long period of time. Schmaltz is delicious, but it’s full of cholesterol. I prefer to cook my latkes in peanut or grapeseed oil, both of which have higher smoke points. 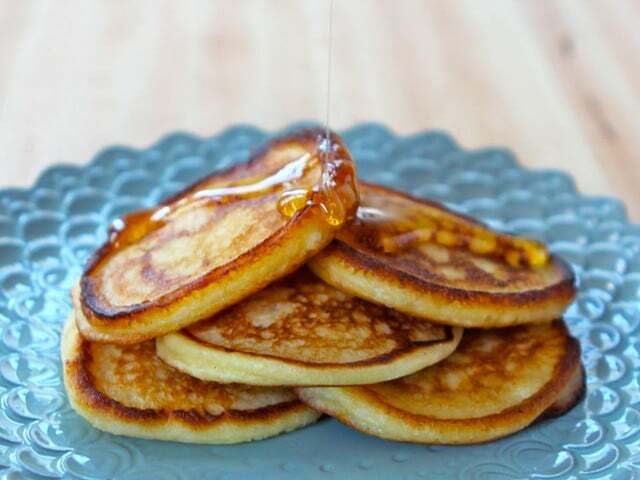 Grapeseed is a healthier oil with no cholesterol, while peanut oil is great for frying and adds flavor to the latkes. No matter which oil I use, I like to melt a little schmaltz in to boost the savory flavor. You can purchase schmaltz or make your own – click here for the recipe. – Always serve latkes hot and fresh if possible. The longer they sit, the less crisp they’ll be. 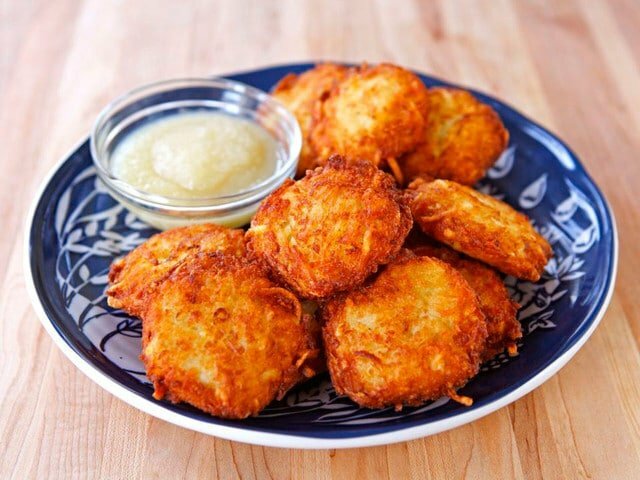 – If you must make your latkes ahead, fry them 4 hours or less before serving. After allowing the latkes to drain on the wire cooling rack, place them on an ungreased, unlined cookie sheet. When ready to reheat, place in a 375 degree oven for about 10 minutes (7 if using a convection oven) until heated through just prior to serving. A convection oven setting will produce a more crispy result. 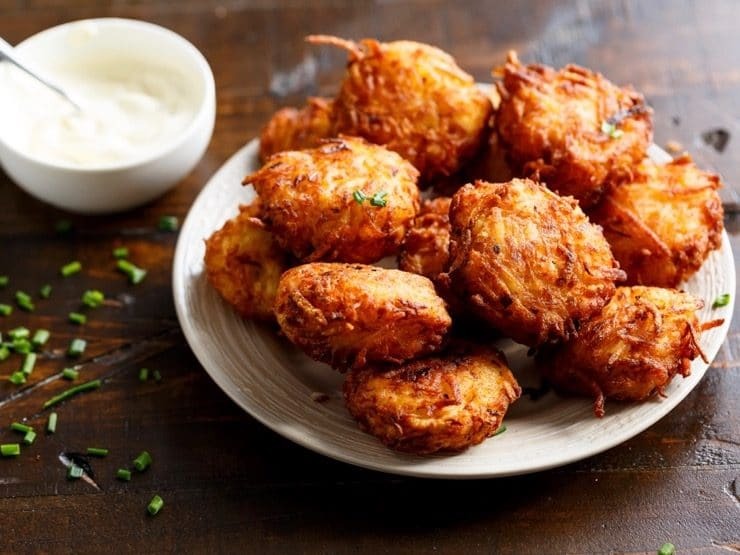 – Latkes always taste best just after they’re fried, but serving them fresh is not always a possibility, especially when you’re cooking for a large group. My friend Denise Vivaldo, a chef and food stylist, has made latkes for large catering groups (we’re talking 5,000 latkes in one sitting!). She freezes them until ready to serve, then uses a convection oven to reheat. The dry, circulating heat of a convection oven keeps the latkes crisp and fresh. You would be wise to take Denise’s advice; she’s catered the Academy Awards and cooked for presidents and royalty, so she knows a thing or two about great food! – To store frozen latkes, fry them and drain the oil, then place them in single layers separated by wax or parchment paper in an airtight sealed freezer bag or Tupperware. When ready to reheat, place them straight from the freezer onto ungreased cookie sheets and cook them 400 degrees F for 10-15 minutes till heated through and crisp (convection oven is best). You can also line the cookie sheets with brown paper to help soak up some of the excess oil. Never refrigerate latkes, it makes them mushy. Okay, ready to make some latkes? 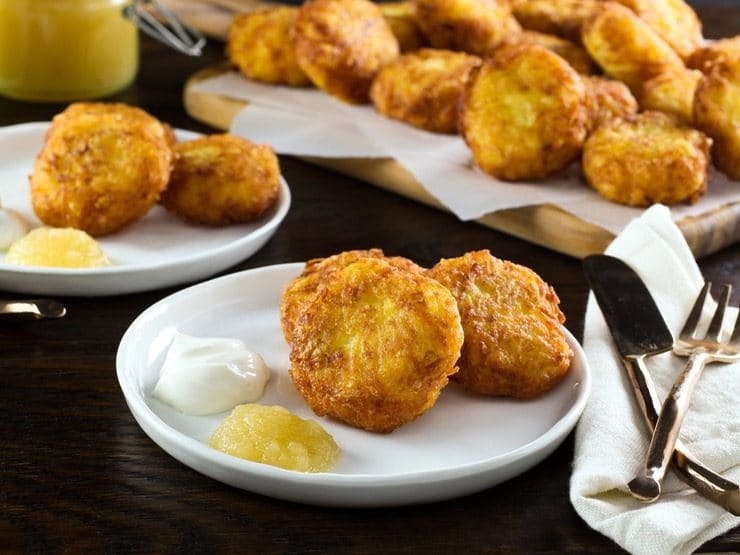 Here are some great latke recipes (and related potato pancake recipes) to try! Loved your latke advice and recipes! My husband is of middle eastern origin and these tips are so helpful. Just read your latkes tips and wanted to add a tip. (I just learned last year) I place a few carrot slices in the oil. This helps keep the oil from turning dark. Happy Hannukah! I’m also a convert and I love to learn from you what my mother could not teach me. Thank you! I don’t have any potato starch and never use it. Your video says that I can use the starch from the bowl and then add also dry to the mixture. Can I just double the amount of liquid starch to make up for the lack of dry starch will that be too much? Would cornstarch be OK instead of the potato starch.. would it make a difference? You can use cornstarch, and all of the liquid starch from the bowl. Thank you Tori— they’re grated and ready to fry…. one box of Homestyle potato Pancake Mix: Mix according to directions on box. Add refrigerated (a large handful) of shredded potatoes, not frozen ones! Combine and makes a lot of latkes. Fry in hot oil in frying pan. Press each down with the back of a soup spoon to get them thin and crispy! Flash freeze on a cookie sheet and then place in a plastic bag to freeze. Heat frozen in a hot oven. So delish! Since the goal is to remove as much water as possible, it seems counter-intuitive to soak them in water as it would require much more squeezing to get them dry.… Is the only reason for the soak to keep them from browning? I wonder if you have a recipe for Livayadka soup? Made these last night. Came out perfect. Recommend using to spatulas to turn. Wanted to post a pic. But I posted on IG: #christophers_kitchen . Thank you. To make them. Thank you for putting up the recipe. My husband, who is Thai, hand grated the potatoes and I made them based on some of the recipes I found on the Web, which included baking powder. The potatoes were ground to fine and overall they were truly terrible. We still had a yen for latkes, so I decided to make them roughly the way my mother did, but using a great food processor instead of hand grating and sans baking powder. I prefer the grated kind, shreds seem to be a more recent addition. I processed the potatoes and onion roughly. Then drained the water out into a bowl using a large strainer. I poured the water out, but saved the starch. I put the potatoes into the bowl, added 2/3 cup of matza meal, 2 beaten eggs, salt and pepper. I prefer to fry in peanut oil and would have added some duck fat, had I found your blog earlier. They were perfect, fried to a golden brown and topped with a good quality yogurt and apple sauce. We just couldn’t stop eating them, so I doubt that there’ll be any left to freeze. You recipe came the closest to my Mom’s except that you shredded the potatoes. I use recipes to get ideas, but when I start to actually cook, I usually just go by gut feeling and ancient memories. I will look up your blog again. Thank you. Glad you found a combination that works for you Dina! I have been making latkes for decades. Both my grandmother and mother-in-law never drained the mixture and often mixed the settled liquid/potato starch back in during cooking. This resulted in a great deal of spattering; water in hot oil. I made latkes again yesterday following your recommendation of draining and squeezing out the liquid. Voila, no spattering, they held together much better, recovered most of the potato starch, and best of all, they tasted just like grandma’s. There is a method to my madness. 🙂 So happy you enjoyed them! 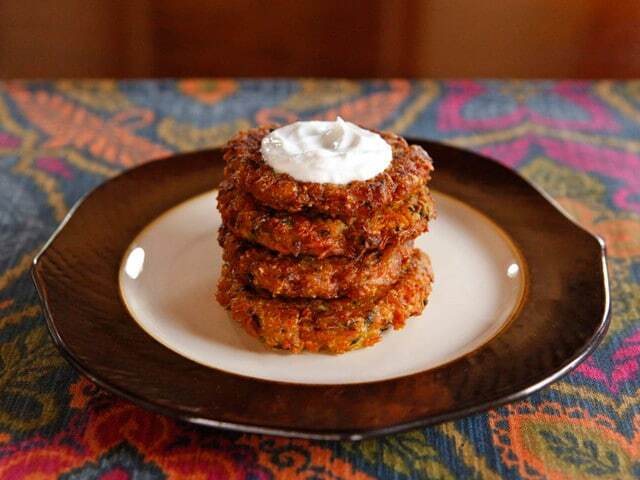 do you have a recipe for vegan latkes. I love your recipe however you should never rinse your shredded potatoes as it gets rid of the starch, even if you are trying to add it back in. That’s not the traditional way of making latkes. Shred the potatoes, drain the liquid, then add the egg and other stuff. What’s the other stuff? Seems like a step is missing. 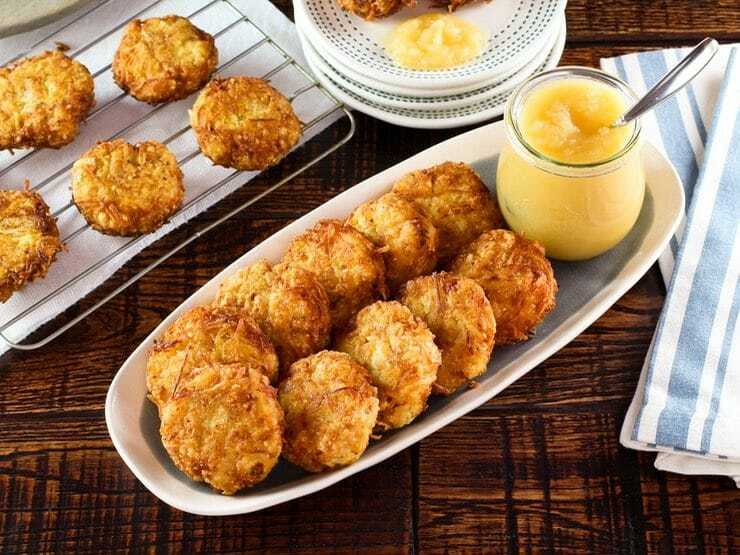 Hi Jason– this is a list of steps to help make great latkes using any recipe. However, they are just tips. You will need an actual recipe to follow. 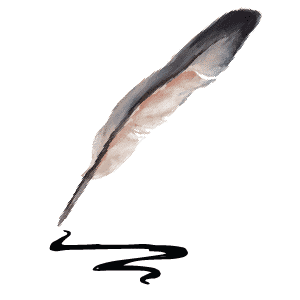 I have linked to several recipes in this post that work well. Can I use Streits Potato Pancake mix? Is that the same a matzo meal? TIA! Just made the Latkas, added some cheese, they were very crisp n too delicious. Thanks for the amazing recipe. nowhere have i seen how much of anything to make. You mentioned freezing them after frying but I’m wondering how long the Latke mixture will keep. Does it need to be used right away or could it be kept for a day or two? 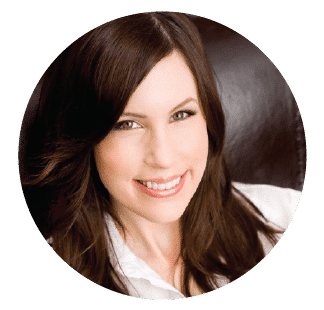 Hi Shane – I do not recommend freezing raw latke mixture. In my experience freezing this type of mixture makes it go grey in color and messes with the texture, making it totally unappealing. Better to make the latkes, then freeze. I just made latkes with your recipe and they’re as crispy as you promised they’d be !! I’m exhilarated! Hello Tori and thanks so much for your Latkes and Savory Herb Braised Brisket recipes. I made both for the first night of Chanukah for my wive’s relatives who are Jewish. I’m not. They all complemented me on the delicious entrees I served and could not believe the flavor. I took the advice of using Peanut Oil for frying the Latkes and sneaked in the Schmaltz. Since I’m from Texas and brisket is a specialty there (mostly smoked) your recipe was outstanding. I did substitute chicken stock instead of beef stock and added some Schmaltz for added flavor. Thanks again and here’s wishing you and your family a healthy and successful 2017! History note: you offer a reason for using olive oil, but seem to pass by the main connection to olive oil: that was the oil used in the Menorah, which is central to the miracle of Chanuka. To prevent the mixture from turning color I use a product called “Fruit Fresh.” It doesn’t change the flavor one bit and keeps the batter nice and white It is available in all grocery stores, generally in the canning supply section. Why bother to add extra chemicals? Just keep the latke mixture covered to minimize oxidation. It’s the exposure to open air that starts to degrade shredded potatoes. Use plastic wrap to cover the mixture inside the bowl, pressing out unnecessary air, don’t just cover the bowl. And don’t potschke in the kitchen: do your mise-en-place (get everything, food and equipment, out on the counter and ready to use), prep your raw ingredients as Tori demonstrated, and get cooking! something like this. She was from Lithuania. Thanks so much! Thank you for all these wonderful tips and techniques. I have always been afraid to try, and just made potato pancakes instead! I always referred to matzo meal pancakes as chremslach. You are correct that everything tastes better with schmaltz. Chremslech are COOKED potatoes and eggs with no onions and are a Passover treat. It tastes so different! Try duck fat for frying – incredibly delicious! I make over 100 latkes each Channukah. I ues the Manischewitz HOMESTYLE Potato Pancake mix because it is the only one with some dried potato in them. I follow the directions but add lots of SIMPLY Potatoes shredded potatoes to the mix with some dried chives and onion salt. I do freeze them in advance and place them in tightly closed zip lock bags after frozen and mark how many are in the bag. That way I can remove any I want to serve. I also flavor smooth canned applesauce with cinnamon candies. Just heat together in a deep pot over low light on stove until candies are dissolved and applesauce is pink. Very yummy! I will take your advice and use peanut oil this time. I also drain them on clean brown grocery bags, turning once during cooling on a clean spot on the bag. I freeze them in one layer on a cookie sheet and when fully frozen, put them in the plastic bags. From one box of potato pancake mix, I usually get 33-plus pancakes. Thank you for sharing your wonderful tips! *You might want to taste a few cooked in peanut oil before cooking the entire batch. Peanut oil has a distinctly different taste. I’ve found that peanut oil, while more expensive, usually makes the crispiest latkes. 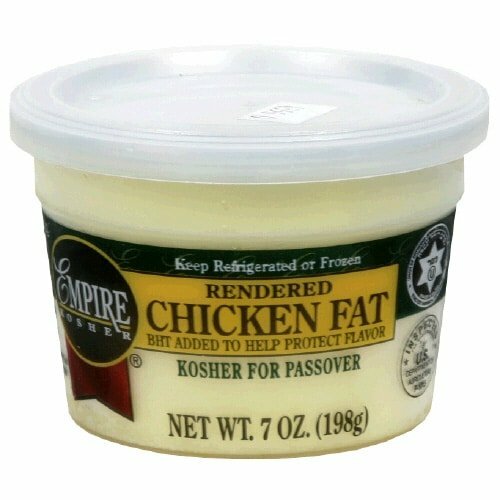 1 question, making the latkes, the mashed potato method (crispy)., whats the texture on the inside like, is it similar 2 shredded.? Hi Allan, Tori’s assistant Ashley here! The texture of a mashed potato latke would be more creamy and dense than a latke made from potato shreds. Is Latke what the germans call Kartoffelpuffer , very popular on oktoberfest . Hi, Tori’s assistant Ashley here! From what I understand, Kartoffelpuffer is also a type of potato pancake, so it’s possible that you’ve had some that are like latkes! We have similar kind of food in Iran which called “Kuku Sibzamini”. The word “Kuku” is for group of different kinds of pancake like food in my country which made from potato (Sibzamini) or mix of sliced vegetables (Kuku Sabzi) or even from walnut and other foodstuffs. Nothing wrong with cholesterol anymore. Did you see the news?? Use schmaltz, B”H!!! I just tried making them your way and for the first time in the 20 years I have been making them, my Latkes turned out perfect! Thank you!! Yummy Tori! I rinsed the potato shreds until the water ran clear. I then spun them in a big salad spinner. I used 1/4 cup for each latke after adding all the yummy ingredients. I then took each latke and squeezed out any remaining liquid in a clean French press. Works perfectly and they were a huge hit! While shredded potatoes are soaking in water, add 500mg. of vitamin C. Then squeeze out liquid. Potatoes won’t darken. Works the same for fruits. Also, I find the latkes tastier (and more nutritious) if one grates with skin left on. I’ve been making, or rather attempting to make latkes for years and this is the first time they worked: tasty, crispy, cooked to perfection (if I do say so myself). I credit the ringing out of the mixture in a cloth (I used one of my granddaughter’s cloth diapers) with the success. (In the past, I’ve tried squeezing the grated potato by the handful.) I didn’t have matzo meal but used some golden breadcrumbs we use here in Israel, and fried them in peanut oil. Forgot the potato starch which didn’t seem to make a difference. Yesterday I sent your website to a friend who had us over for the curry vegetable ones which were also amazing. Hello from Brussels, Congratulations for your site, and although I have been making Latkes (Ashkenaz way) I have learnt some useful hints from you. Looking forward to your cholent recipe. I have always wondered how to make a good potato pancake, and this has given me lots to try. I am LDS, and my family Catholic, so Jewish cooking is just about right for me – Thanks for sharng your recipes! Here in the UK I always make a large number of latkes for our small Shul community at Channukah. In the UK everybody I know would never dream of eating them with apple sauce or anything else sweet, they are always savoury. (And gefilte fish are fried as often as they are boiled). But I always just ever so slightly undercook latkes ie no darker than golden, freeze them, and then they heat up wonderfully in a hot over. In fact I make a large batch for home and then just use now and then, they go wonderfully with viennas that we are having tonight. Came to your site whilst contemplating the next batch. Simply potatoes have not arrived in the UK, but I assume they are just frozen grated potato, but what is its intended use? Simply Potatoes actually isn’t frozen, they are shredded uncooked potatoes in the refrigerated section. They are mainly used to make hash browns. Best latkes I’ve ever made. I finally understand about draining the potatoes, for one thing. Thanks – we all ate well, even if Chanukah was finished! In Russia, they have the same called draniki. But instead of onion they use garlic. These look really yummy. I had a couple of thoughts, though. The first being, this would be divine fried in lard/bacon grease. Oops! I’m not Jewish, so it took me a minute to remember that is a big no-no. The second thought was, when did potatoes enter the traditional Jewish diet? Potatoes are from South America, and they would not have been available to the Jewish people before the 1500s. Tried your recipe! Not bad- I did had to add one more egg and some panko for crispness;) thanks! I want some of these. I’m going to look up the recipe and try to make some . Even though I’m not Jewish, I’m Jewish at heart. Love them-they’re good anytime of the year!